Neil and I have been married 19 years. We reside at the kennel and our family includes our four legged furry friends: Ben, Buck, Tucker, Reverse, Silver, Ice, Polar, Kola, Kozy, Dakota, Reno, Dingo, Busy, Sissy, Panda, Kodiak, Kanuck, Meika, Timber, Porriage, Tesoro, Cheena, Yukon, Columbus and Bob, the kennel cat. As my mother says "we have gone to the dogs." Our main interest in life at this time is our sled dogs. We are very involved in them and spend most of our time in the fall and winter training and running. During the summer the boarding facility is very busy and takes up most of our time. We are members of the CKC and SHCC. Our main sled dog activity is mid and long distance. We have been involved with our dogs for 7 years starting with one and growing. We were going to quit at 12 but just dont know what happened. Dakota - Waiting to Go What sparked your initial interest in sled dogs? Our first Siberian, Dakota, we acquired from a friend who was moving from the country to the city. The first time we laid eyes on her we were hooked. She was just the most beautiful animal we had ever seen. After meeting some sledding enthusiasts we decided this is what we wanted to do so we traced back to where Dakota came from and off we went to get a new puppy. Well, we came home with two and so our family began to grow and grow and grow. Some friends of ours were involved with a charity run in Manitoba called Mushing for Miracles for the Canadian Cancer Society so we sent Dakota for the winter to train and be part of this wonderful event. It was very hard not to have her around but we felt this was the best way to have her trained by someone who knew what they were doing. 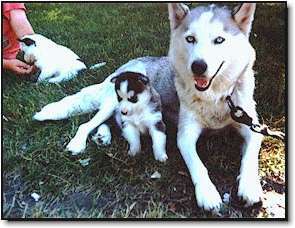 I remember the first time we went out with Dakota, Sissy and Timber. Down the road, oops the ditch and into an open field with snow up to our waists. Well, I guess practice makes perfect. Our mentors over the years include a number of people - Bob Draward, Doris Prefontaine and Martin Buser. Bob being a long time musher, Doris a world sprint champion, and, of course, Martin. I met him at an ISDRA Conference in Winnipeg a few years ago. I learned so much just listening to him speak. A truly wonderful family man whos way with his dogs is truly amazing. Bob and Doris have always been there for us sharing their ideas and opinions, but always free and willing to give us sound advice. 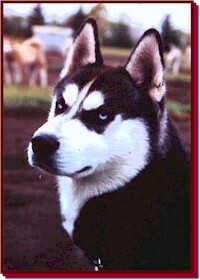 At present we have 19 wonderful huskies--15 adults and 4 puppies to begin training with this fall and winter. We feed EAGLE SUPER PREMIUM PET FOOD and supplement with a mixture of ground beef and fat when we begin training and running. Our kennel management style would be lots of TLC, good nutrition, shelter, vet care. Our kennel basically consists of Siberian Huskies with a few Alaskans. Although physical characteristics are important, it is more important for good temperaments and heart. The basic desire to run. All our dogs are very special and dear to us. I guess one of our favorites would be Franco - our first lead dog - who we purchased - he taught us so much as well as the dogs. He always was there and did his job when times got rough. When choosing breeding stock, the important factors we look for are a clean bill of health and temperament. We found the easiest way to train pups is just put them in a small team and away we go. All pups, however, are very well socialized by this time with both humans and dogs. Again the most important thing is a pup is the desire to run. Making it fun for the dogs is very important. 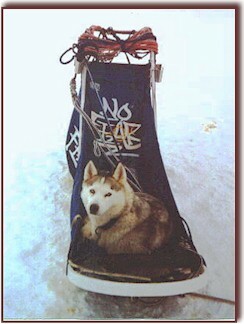 Sled dog sports are growing rapidly. There are a lot of people out there, however, that need to be educated on sled dogs. Mushers must take the time when promoting to assure the outside world that this is what the dogs love to do - run, run, run - that is what they were born and bred to do, and that these dogs are not being mistreated by making them run. Advice to a beginning musher if they are serious about the sport would be to invest in a good leader. They will teach you and your dogs.